There is nothing more appealing than a luxury watch. Seeing the name Rolex, Omega or Breitling on your wrist is enough to boost your ego. This is exactly what drives replica watches stores to offer an irresistible collection of popular imitation timepieces. Joinwatches.org is one of those online shops that carry a wide and diversified selection of best-selling fake watches. Besides the nice looking products and low prices there is another important thing we should consider before placing an order and that’s how reputable the merchant is. This is exactly what we will discuss below. Keep reading to find out! Joinwatches.org isn’t that friendly looking. The design of the website is just too much for our eyes. The background has a checkered pattern; the center page is white and populated with elements that bother visually. The numerous upper buttons and banners that overlap one another, the green thick menu bar and the main wide banner that features at least a dozen different watches stuffed in the middle of the page- all these are just too much to bear. The numerous different visuals ruin something that could have been a decent looking online store. Every brand is organized into sub-collections. For instance, Rolex is divided into DateJust, DayDate, Air King, Submariner, Daytona and so on. Every sub-collection includes a couple hundred different models. Unfortunately, these items aren’t organized by important criteria as the inside mechanism and there is no filter available to sort them. This is a huge inconvenience not only because the styles are mixed up, but also because the different types of grades like Swiss Valjoux, Asian movement and Quartz movement are randomly displayed. If you are interested in ordering a particular type of movement like Swiss you need to spend a great deal of time locating the models that meet your search criteria. As I was saying earlier, this merchant offers a diverse selection of replica watches with Swiss automatic, Asian self-winding and Quartz movement. As expected, the prices vary depending on the inside mechanism. The Swiss valjoux movement fake timepieces cost about $300-$450, the Asian automatic mechanism knockoffs are priced at $120-$170 and the Quartz movement imitations cost about $100-$150 depending on the complexity of the model. The important thing here is that no matter how you look at it, these prices are still pretty affordable. Joinwatches.org has some incredibly good quality product pictures. Every single one of its replicas has on its page a very nice selection of high clarity photos that show the knockoff from every possible angle. There are about 15 images for every product and these pictures show the dial, the bezel, the case, the buttons, the case back, the strap, the clasp and even the inside mechanism. There is even a great attention for showing close-ups of the markings and finishing. Everything suggests professionalism. 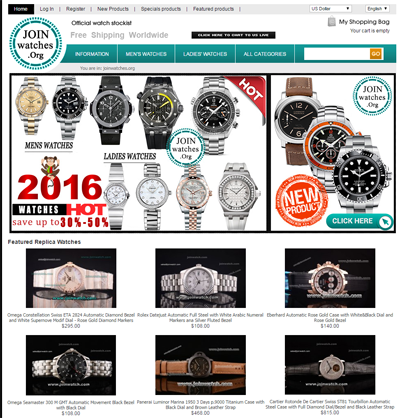 For seeing how accurately cloned these imitation watches are I have taken one picture of a fake Rolex DateJust from the Joinwatches website and one picture of the authentic watch from the Rolex webpage. The purpose is to compare the look of the timepieces and see if this replica merchant offers perfect reproductions. As you can see from the images, there are a couple of very visible differences. Most of them can be found on the dial. Rolex makes these silver dial silver case Arabic numerals models only with blue hour markers. It doesn’t offer them with silver ones. The minutes indexes are also different. The ones that correspond to the hour markers are also Arabic minutes indicators. I have also noticed that the wording on the dial is more spaced apart on the replica and that the white background of the date aperture is not as obvious as on the authentic watch. The bezel and the case look good, but the winding crown is not as elegant as the genuine one and the bracelet is in a different style. The authentic watch has the sportier bracelet with the thicker links while the replica has the stainless steel band that looks more like a jewelry bracelet with dressy narrow links. The most interesting thing about its shipping policy is that there are 4 different options for dispatching the package. The first one is free and it implies that your package will be shipped with Hong Kong Post and the estimated delivery time will be about 15-20 working days. The second one is EMS, it costs $12 and the shipping time is 10-14 business days. The third one is DHL, it costs $30 and the delivery time is 3-5 business days. The fourth one is FEDEX, it costs $35 and the usually shipping time is about 3-5 business days. Joinwatches.org takes a surprisingly diverse range of payment options. The company offers to its customers the chance of paying by Visa, Western Union, JCB, Western Union and Bank Wire. Those who have their share of experience in ordering replica watches online know that most retailers take only Visa and Mastercard. These companies do not bother offering alternatives because credit card is usually the fastest and most efficient way of cashing in your money. If you have received your replica watch and you discover some faults then for me it is unclear of what your options are in this case. I say this because on the Return page there is no word about a refund or replacement policy. It only says that the company offers a 180 days repairs warranty that covers manufacturing defects. But there is no word about getting your money back if you are not happy with the product or exchanging it for a different model if you do not like it. This feels kind of shady to me and I highly advise you to get in touch with customer service to confirm if they offer a replacement or refund guarantee for their replica watches. Make sure you do this before you submit the order. Customer service is a matter of perspective. For those who are more professional and considerate with their customers, customer service means phone, email and chat services. On the other hand, for those like Joinwatches.org a common Gmail address and a Skype account are enough for attending their customers. You see, I just can’t agree with this approach. For me, a decent and reputable merchant offers a high level of customer care and is always available to solve its customers’ problems. What can I say? It is impossible to find the perfect replica watches merchant. Every company was its pros and cons. Joinwatches.org has great quality pictures, affordable prices, a diverse range of payment options and many delivery methods, but it disappoints with the lack of information about its return policy, inaccurate design of its products and poor customer services. Do you have the new site?